The figuarts line has produced the best Dragon Ball Z toys ever made and they have brought fans some amazing figures letting them decide what comes next in the line. The next pre-order is Krillin and thanks to Amazon.com he is the cheapest release in the last several years. 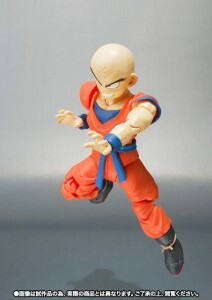 Most of the figuarts pre-orders start at about $60-70 but Krillin is at a bargain price of $40 at the moment. I’m not sure if this is a temporary mistake on Amazons side or the Figuarts figures are coming down in price in the long run. At the moment it looks like a great investment as Krillin probably wont get reissued after the initial release as Figuarts are still yet to release Android 18, Normal Goku, Nappa and Great Saiyaman over the next 12 months or so.